Presently we bring you this new musing series by Prof. G. Venkataraman which is on the 'Essence of the Gita'. In this modern age of rationalism we tend to refuse to accept anything that is not offered on the platter of scientific approach. And that is what makes this presentation by an eminent scientist a work of unquestionable relevance. He has infact authored a comprehensive book on the Gita: Conversation Between God and Man, which is popular as much for its profundity as its lucid and simple-to-understand conversational style. Loving Sai Ram and greetings from Prashanti Nilayam. For quite some time, I have been receiving mails asking me to give a series of talks on the Gita. In my earlier musings, I have no doubt touched upon matters discussed in the Gita, but giving an entire series is a different matter altogether. It requires time and concentration of a type I am no longer able to afford; too much work. And yet, the pressure has been mounting all the time. So I have finally decided to yield to the pressure, treating this also as a part of my regular work. First things first and let me begin by offering this entire series, every word of it, to Swami, who is the sole Motivator and the Inspirer. Next a word of caution to you dear reader, who has been with me all these years – I shall try and do my best but please do bear with me for blemishes which are bound to creep in. With this caveat, let me take the plunge! I do not exactly remember when I first heard about the Gita; it sure must have been when I was very young. In some manner or the other, strange as it may sound, there has always been a bit of Gita in the air of this country. And since Gandhi was very much alive when I was young and since he always swore by the Gita, I am sure in some vague way, I kept on absorbing now and then a bit of the Gita, both directly as well as indirectly. Here I must rush to caution that the Gita must not be thought of as a text apart from the rest of ancient Indian tradition and spirituality. The Ramayana, for example, is a worked example of the Gita and it came before the Gita was actually taught to man! That is amazing, is it not? Anyway, to get back to my ramblings, till I retired and came to Swami’s Lotus Feet to spend the rest of my life in Puttaparthi, my knowledge of the Gita was less than a smattering. It is only here that my curiosity was aroused, mainly by Swami’s discourses and His famous Trayee sessions; since then, the Gita has always been with me. I first studied it in some detail and began to think about it. Then I discovered that Swami was teaching us the very same lessons, far more elaborately and with innumerable examples. This inspired me to pay close attention to His discourses. After that I read the Gita Vahini and discovered new treasures; and the discovery goes on. The beauty is that as one’s experience accumulates, the nuances of the Gita and of Swami’s teachings become more and more evident. Thus these days, I am able to see far more clearly than ever before how much the Gita is relevant to human society at the current juncture. More about this later, but here I might mention that this series intertwines with my other series on Awareness. In a sense, the two series are like the two strands of the DNA, same message but presented in a complementary fashion. I guess I have said enough by way of an opening statement, and let me now really get started. The Gita is God’s message to man and therefore it is useful to start with the question: “Who is man?” This is not as stupid a question as it might sound. In the Cosmos that spans everything from the tiniest atom to incredibly huge galaxies, the human being occupies a very special place. The reason is simple. As Swami says, man is 85% Divine and only 15% contamination. However deluded by the illusory attractions of the world, humans allow the impurity aspect to dominate, masking the latent Divinity. Often this eclipse becomes near total, making individuals wonder whether they are really Divine, though Swami often reminds them they are. Occasionally some people suddenly wake up and realise that there is an entity called God and start going in search of Him. Good, but they do not know how to search and where to search. Gita is the manual that helps in that journey of discovery - that is the first teaching of Swami. Next, how do we go about searching for God, and how do we budget time for it? Do we, for example, say, “OK, I will look for God once a week on Sunday, or when I take my annual vacation?” Nothing of that sort! You may not like to hear it, but according to Swami, our entire life must be a quest for God. Now don’t blame me; that is what God says! But listen, do not jump into a well of frustration; it is not as bad as it might seem and there sure is a beautiful reward if we make life a journey to God. Which brings me to the important question: “What is the purpose of life?” This question has got etched into my memory because of one particular Trayee session. For those of you who are not familiar, the Trayee session refers to the intimate sessions Swami had with the boys when He was in Brindavan. After evening darshan is over, the boys run to the Trayee building and assemble in the circular veranda there. At one end of this veranda there is a swing, and after boys are all gathered Swami gently floats in and takes His seat. Man is born so that he need not be born again. And when he dies he never should have to die again. What it means is that we make sure that at least this lifetime, we use our stay on earth to get back to our true home, GOD. 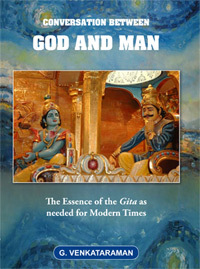 By the way, the Gita Vahini is a must read and it is readily available in our bookstore here. More on this theme of rebirth, etc. later. Let me take you back to Trayee Brindavan and recall another particular session. On this day Swami asked, “What is the essence of the Gita?” Many replies were given but Swami simply remained silent. Obviously the correct answer was yet to come. Swami then changed His approach by asking, “What is the first stanza of the Gita?” This time, many came forth with the correct answer. The same happened when Swami asked, “What is the last stanza of the Gita?” Swami smiled and now asked, “What do you get when you combine the last word of the last stanza with the first word of the first stanza?” That was easy and the boys in a chorus shouted: “Mama Dharma!” Swami nodded His head and said, “That is right. Mama Dharma is the real essence of the Gita.” What He meant was that leading one’s life according to the principle of Dharma is what the Gita is all about. That would be the constant theme underlying this series, understandably so. I am sure you all know that Krishna taught the Gita to Arjuna just before the start of the epic war between the Pandavas and the Kauravas on the battlefield in Kurukshetra. Surveying the two opposing armies waiting to slaughter each other, Arjuna has deep misgivings about the usefulness of war and wants to quit. That is when Krishna begins His advice to Arjuna. Krishna began with what seemed like a pep talk. But as He went along, Krishna gave detailed justification for why He wanted Arjuna to fight and not quit. This is a very important point and needs deep reflection. Arjuna argued against war saying that it was not worth winning a kingdom after killing one’s own kith and kin, etc. On the face of it, Arjuna’s point appears quite convincing; but there were nuances that Arjuna ignored and Krishna pointed out that there was much more at stake than winning back a kingdom that the Kauravas had grabbed by deceit. One might even say that Krishna had engineered the whole thing, including the sudden misgivings of Arjuna. The war was not about a kingdom but about Dharma versus Adharma. Arjuna who had earlier sworn to fight on the side of Dharma was, at the last minute, giving all kinds of reasons and trying to quit. Krishna said, “No way, you can’t duck duty,” and that is what Mama Dharma is really all about. In His elaboration, Krishna points out that in life one gets constantly entangled by the tussle between good and evil. This struggle is a never-ending one and humans must never remain neutral or duck. They always have the responsibility to fight for the cause of Dharma; upholding Dharma - that is what duty really boils down to. Fighting does not mean taking up arms and waging war but standing up to Adharma (unrighteousness) and not letting it get away. Seen in this manner, we all have to admit that Bhagavad Gita is needed more now than ever before. Which also is why Mama Dharma so very relevant in this day and age. Thus, in this series, I shall stress Mama Dharma at every conceivable opportunity, something that is not usually done; but then I am just trying to follow Swami. Moving on, the Gita really caused a change of attitude in society. Prior to Krishna, seeking Divinity was something that rishis (sages) alone attempted. They would retire to the forests, meditate intensely, and seek God; ordinary people on the other hand lived their life as usual. The Gita changed all that. Krishna ensured that His Message was delivered under dramatic circumstances and in a forceful manner so that it would reach all and also be remembered for a long time. The beauty of the Gita is that it allows people to seek God in different ways best suited to them, but moving in a general direction, the direction of Dharma. In particular, the Gita opened the door to making ordinary life a gateway to God by blending Bhakti (devotion) with life. Thus, reaching God was no longer the exclusive prerogative of the rishis; more about this later on. The field on which the battle was fought was called Dharmakshetra. Historically, this was a holy place where sacred and auspicious acts were performed. At the same time, historically it was also the place where the wicked offsprings of Kuru, the dynastic family of Kauravas lived. So it was also called Kurukshetra. When a body is born, it is pure and unblemished. Such a body is a Dharmakshetra. As the body grows, it goes on collecting different types of bad qualities like jealousy, hatred, attachment and so on. When these tendencies develop, the same body becomes Kurukshetra. Thus the same body is both Dharmakshetra and Kurukshetra. Good and bad are both encased in your heart. The war between the Pandavas and the Kauravas did not last for more than 18 days, but the war between the forces of good and evil continues throughout your life; it has no end. The war is fought on the field of Dharma. Life is a battlefield, a Dharmakshetra, where duties and desires are always in conflict. That is right. Sometimes the forces of good dominate while at other times, it is the other way. The question is which one has the upper hand generally? The answer to that depends entirely on the tendency of the person concerned. If man allows himself to be guided purely by the instincts of the senses, he would descend to the level of an animal. If he follows the body and the Mind, he would be transformed into a demon. Man’s only option is to follow the Heart, under all circumstances. That is the reminder that Krishna gave to mankind, when He spoke to Arjuna. And the essence of that reminder is Mama Dharma; and that is the reminder that Swami is giving us! In view of the above, my presentations on the Gita would be different from the conventional ones. The standard operating procedure is to go through the Gita, Sloka by Sloka, with comments, illustrations, etc. I would be doing it differently. I shall be taking either one chapter or a cluster of chapters with a common theme, draw attention to the highlights, and then try to explain how all this is connected with Mama Dharma. In other words, like the planets all moving around the Sun, I shall take you along different orbits, but always looking at the central theme, which is Mama Dharma. That is what would make this series a bit unusual; and I adopt this approach not merely because Swami has declared that Mama Dharma is the essence of the Gita but also because Mama Dharma is indeed the crying need of the hour. I strongly believe that is why Swami has forcefully called attention to it, and my task is to reinforce that call. I hope I have made my point of view clear. A few comments next, before I wrap up this introductory talk. The book 'Bhagavad Gita' that we all buy and read has about seven hundred Slokas (stanzas). Many have had this doubt: “Seven hundred Slokas? Did Krishna really sing His way through all these seven hundred verses right in the middle of the battlefield, while two armies facing each other and itching to fight patiently waited for Krishna to finish?” Believe it or not, a curious person even ventured to ask Swami that question. Swami smiled and replied that Krishna spoke to Arjuna only for a few minutes. Later, Sage Vyasa (himself considered to be an aspect of Vishnu, whose incarnation Krishna is supposed to be) amplified what Krishna said to Arjuna into seven hundred and odd verses, packaging them into eighteen chapters that the world now knows as the Gita. “Bhishma, the tenacious warrior and venerable scholar knows that justice is on the side of the Pandavas. He has even made a public proclamation of this. But he is leading the Kaurava army, which means that his deeds do not correspond to his thought and words. Harmony of thought, word and deed is the greatest virtue, and its absence is hypocrisy and wickedness. The importance of harmony of thought, word and deed or Trikarana Suddhi as Swami sometimes refers to it. These two qualities are vital for following Mama Dharma. We seldom pause to reflect on the sheer beauty and simplicity of Swami’s teachings. We are all in such a tearing hurry all the time, sending useless SMS messages. Ramakrishna Paramahamsa says that God alone can explain complicated things in such a simple manner that even a child can understand. Here is the Avatar who has spent so much of His time trying to give us the gift of Atma Vidya or the Knowledge of the Self, and we waste our time doing inconsequential things! The purpose of these talks is mainly to take you back to that pristine source of Eternal Knowledge! God, give me strength to do that! Getting on, I must, before I conclude this talk, make a reference to a few other points. The first concerns Sreyas versus Preyas. Swami used to make frequent reference to this in the old days but these days He seldom does. Perhaps He has got tired because few seem to be paying attention. Since the point is very important, allow me to explain what it is all about. Preyas refers to the pleasures that the external world so obligingly and so readily offers while Sreyas refers to the bliss that comes when one explores the depth of the Inner World. Man is so much immersed in and involved with the external world, he is all the time in quest of Preyas. Whereas Preyas appears nectarine and deludes, soon pleasure turns into pain, as people who have become drug addicts or alcoholics would readily testify. OK, agreed Preyas is bad medicine; can we therefore simply cut off from the external world? Is that at all possible in this day and age? Swami has the answer. Let me explain that answer using modern idiom. These days, millions and millions not only have a computer but are also connected to the Internet. Now the Internet is full of viruses waiting to attack. So what do smart people do? They equip their systems with firewalls that block viruses. That is what we must do while going through life. Yes, we must be in society and be involved in its activities as a doctor, lawyer, teacher, pilot or whatever. However, at the same time, the Mind must be suitably protected with a “firewall”. The Gita describes the firewall system that we must install. Swami described this beautifully during one Summer Course. He said, when we walk, we use both feet, the right and the left. In the same way, we must go through life by being in the outer world and also by spending time in the Inner World. It is like this; we go out and play a vigorous game of tennis say. What do we do when we come back? We take a shower, do we not? In the same way, we must set some time apart so that we can retreat into the Inner World and periodically take spiritual showers! Thus, a balance is required. Swami all the time recommends balance. He does not want us to withdraw. He did not want Arjuna to quit. He wanted him to go out there and fight. But fight keeping Mama Dharma in view. Similarly, as Swami says, our hands must be in society while our heads must be in the forest – a beautiful metaphoric expression of the fact that life must be a balance between a quest for Preyas, and a search for Sreyas. Next, a few words about man and his position as well as role in Creation. This is a very important point and merits a few words. Man is a part of Creation, which exists because God created it – this we all accept. Now God in His infinite compassion and mercy has packed the Universe with all kinds of goodies, and man generously helps himself to it – for example, oil below the ground. God has no objection to man using that oil. In fact, man sells the oil he pumps out and makes huge profits but does not offer one cent to God; but God does not mind. What is worse, man does not even spend a moment thanking God for all that He has provided so that man may live and prosper. Tell me, how many of us ever take a second off in a day to thank God for air, so vital for the sustenance of life? We hardly do. Instead, mankind today is constantly polluting air in a thousand different ways, by smoking, by using cars that emit horrible gases, by building huge steel plants that pump hundreds of thousands of tons of sulphuric acid into the atmosphere. This is just a sample of the deep ingratitude of man. The Gita reveals that the Universe revolves using a delicately constructed chain of sacrifice, and that man is an integral part of that chain. He simply cannot dissociate himself from that chain of sacrifice, as he is presently trying to do. If he does so, there is a heavy price to pay. The way things are going now it looks like the writing may in fact be on the wall! The Gita, let it be known, made clear five thousand years ago, how man must live in harmony with Creation, which means being true to his Divine origin, being compassionate to fellow human beings, not harming Society and being in harmony with and respectful to Mother Nature. If he fails to do that, all his profession of love for God would be empty and without any meaning. Man is not at peace with himself till he has become like unto God. The endeavour to reach this state is the supreme and the only ambition worth having. And this is self-realisation. This self-realisation is the subject of the Gita, as it is of all scriptures. The Gita has become for us a spiritual reference book. So Mama Dharma is the essential core of the Message of the Gita, and understanding it means understanding the five take-home lessons I just listed. That about brings me to the end. I hope I have not lost you on the way. I have lots more to say in the future talks. In all these, I shall always try and stay close to the central theme of Mama Dharma, rather than laboriously dragging you through the seven hundred and odd slokas. I am not equipped to do that, and there are many wonderful and scholarly texts already available that can take you on that kind of a tour. I want to give you a helicopter ride, pointing out all the time to the beautiful earth below, called Mama Dharma! Offering my gratitude to Bhagavan, I shall stop here. May God be with you always. Jai Sai Ram.